10/19/12 – Pix from the dedication are here. 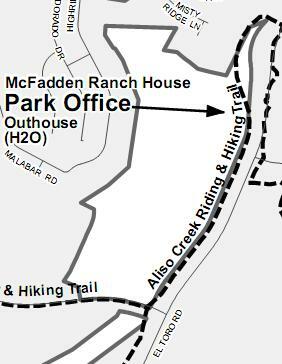 10/17/12 – Aliso Creek to gain National Recreational Trail status on the 18th. See our post about it here. Update: 7/5/12: See our post about a new parking situation Woodfield Park. Heading SW: Use Los Alisos at Muirlands to (L) Paseo de Valencia. Heading NE: Stay on Paseo de Valencia, (R) at Los Alisos, and regain the trail on the NE corner of Muirlands . History and background of Aliso Creek. Facilities: 2 porta-potties in the back corner of the parking lot, full service at parks on the lower portion(from Hero’s park), none on upper. Parking: If you drive to the start, parking may be at a premium with limited on street parking (free), or paid parking (3-$10) in the dirt lot. Do not park in the church parking lot – there’s a reason it is (usually) empty! If both the street and park lot are full, the closest place to leave your vehicle would be Woodfield Park in Aliso Viejo which has trail access, water, and restrooms. The Aliso Creek Trail is a treasure in the South County. Rising about 1,100 feet over 13 miles as it follows its namesake through suburbia, the trail ends without notice about .5 mile from the intersection of Santiago Canyon and Live Oak, Yes, you are within reach of the infamous Cooks Corners, and many mountain trails in the Santa Anas. Starting from Alicia and Awma road at the Aliso and Wood Canyon Park, the trail begins by the bridge and heads inland with the creek on the right. About 2 miles from the start, a spur will connect with Woodfield Park on the left if you need services. About a mile later go left after crossing a wooden bridge over the creek, otherwise you will be on the Alicia Creek Trail and headed the wrong way! After crossing under Moulton Pkwy, you will be at Sheep Hills park. There is a water fountain on the far side of the park, and porta-potties alongside the trail. Follow the trail / sidewalk left towards the northwest side of the park, and follow it right as it parallels Laguna Hills Dr. To avoid riding in traffic,* stay on the sidewalk and proceed up the hill. The standard bike trail asphalt surface will appear by the Laguna Hills High School as you make your way to the intersection of Paseo de Valencia and Laguna Hills. Watch for cars making right turns as you use the crosswalk to cross PdV, and again to cross LH to enter the trail as it picks up on the North East corner in nice shady parkland. Use caution as the trail crosses 2 streets at grade level and bear right in the valley as the paved trail heads inland. *Note: Experienced riders may choose to ride in the marked bike lane, but be aware you will need to cross 2 lanes of fast traffic to get in the right left turn pocket (there are 2 left turn lanes here) at Paseo de Valencia. If you can’t make the turn, use the pedestrian crosswalk button on the right at the corner to get across Paseo de Valencia. The marked bike lane striping on Paseo de Valencia ends here, but depending on your comfort factor, you may choose to ride in traffic as the road widens just a bit past the bus stop . You will parallel the trail as it winds along to your right along Paseo de Valencia as traffic whooshes by on your left. Get back onto the trail by entering onto the sidewalk at the 2nd intersection, or by a hard right at the base of the hill you came down and before you would climb to reach Los Alisos Blvd. Moving inland, the trail makes a sharp right followed on a short downhill by a blind left, so watch your speed and be mindful of oncoming riders or joggers on the wrong side of the trail. Rising gently, the roar of traffic increases as you approach the 5 freeway and, bearing right, enjoy a smooth downhill. Go left under the freeway being mindful of sand as you approach, and water that is usually running in the middle. If you go slow you might avoid the dreaded “racing stripe” up your back if your bike has no fenders. Continue forward with the creek on your right as you leave the freeway behind. To your right across the creek is Sycamore Park, Mission Viejo, with a trail that goes through the park which will rejoin the trail you’re on at the wooden bridge. There is a water fountain at the playground, but El Toro Park lies just ahead and has better facilities less than a mile away. After following the winding creek you’ll come to a steep ramp taking you under Los Alisos Blvd. which may have sand or debris at the base. Watch for glass as you pass underneath the roadway and go right across the metal cover* (which can be very slippery if wet), and left up the steep incline to emerge in El Toro Park. As you wind towards Muirlands there is a wooden bridge that crosses the creek on your left. Water and restrooms are by the tennis courts, so whether you’re full of it or need more of it, cross the bridge to take care of it, and retrace to follow the trail under Muirlands being careful of possible glass and debris. *Note: If the creek is impassible, reverse direction and turn right after the steep ramp onto Los Alisos Blvd. The road is wide here as you make your way to the traffic light at Muirlands. The trail entrance is on the NE corner, so either get in the left turn lane if traffic allows, or cross Muirlands and use the crosswalk signal to cross Los Alisos Blvd. Now with Los Alisos on your right and Muirlands behind, you rise next to a golf course on your left (shhhh!) and descend back towards the creek. A sharp right takes the trail under the railroad tracks and into Hero’s Park in Lake Forest. There’s plenty of parking here with a water fountain and porta pots if the restrooms are locked. This park could also be a launching point to your Aliso Creek adventure. BTW, this park has the last restroom / porta-pot on the trail (hint) until you’re almost at the trail end where water and a porta-pot are available at the McFadden House. Another quick left then right takes you under Jeronimo heading towards a wooden bridge on your left. Go across the bridge and right to resume a gentle, almost imperceptible climb with the creek now on your right. Shortly you’ll come upon a rest area on your left with a water fountain, picnic tables, bike rack, and a trash can. Moving on, the grade picks up a little as you approach Trabuco. Go right and cross the creek on the wooden bridge, then go left to go under Trabuco. Watch for riders entering the trail from Trabuco on your right as you meander into Sundowner Park which also has a water fountain. A sharp left under El Toro brings you up onto the sidewalk with El Toro to your right and the creek to your left. Use care as the pavement is cracked in many places and the trees may need trimming. The trail leaves the sidewalk going left under the roadway and widens as it continues towards Santa Margarita/ Portola. Going left and under the roadway, watch for debris from any recent storms as well as debris on the trail as you emerge from the underpass. This section of trail (between Marguerite and Santa Margarita) can get flooded with mud and standing water a couple (2-3) of inches deep after a severe storm. If it’s really bad, you may have to cross El Toro, and continue inland (same direction you were on the trail) to Marguerite. Crossing El Toro at Marguerite, start down El Toro and you will see a paved entrance leading to the trail and parking on your right. Take this down to the trail and go right to continue your adventure. Past this point you may sense a shift in the climate. If it was warm when you started, it will probably be hot at this point and will only get hotter the further you go up the trail. There are no facilities or water ahead so make sure you’re prepared. As you make your way to the 241 overpass the trail widens considerably. The noise begins to soften as you make your way up and up the false flat section, then the trail narrows as it goes under Glenn Ranch. Single file through here and stay to the right, as riders may be coming down the trail and reaction times are drastically reduced. The trail widens again as you leave Glenn Ranch behind. Around a bend to the left, it narrows again and goes up a sharp incline which translates into a fun run downhill until bearing right and you are faced with a short and possibly brutal incline if you aren’t geared low enough. To the left is access to the McFadden House/Whiting Park HQ which has water and porta potty about 50 feet off the trail. Past the turnout for the McFadden House, at the “summit” of the incline you have a choice to make. Go right to pass under El Toro, then left to emerge onto Santiago Canyon and points beyond like Cook’s Corner where there are refreshments and restrooms, or go forward to the trail end at the side walk. You have reached the end of the trail; congratulations! People may be coming from all directions so don’t block the trail and become an obstacle while deciding which direction to go next.